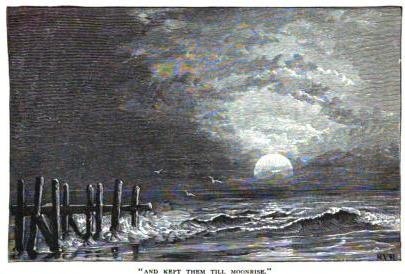 Great vintage black and white drawing of a moon rising at the beach. This public domain landscape image would make a great addition to a notecard or scrapbook memory page. Oh how excited the children of 1884 must have been when they recieved their St. Nicholas: an Illustrated Magazine for Young Folks. We found a bound copy of several versions and it included this and many other drawings which are now in the public domain.